Special Foods International Ltd. P.O. Box 7160, Nairobi. Kenya. Effect of chemical treatment (surface and oral) using chlorine and TH4 of life broilers before slaughter and slaughter conditions on bacterial and keeping quality of broiler meat was investigated. The objectives were to improve both bacterial and keeping quality of broiler meat and to identify critical control points in processing of broilers. Nine hundred and sixty mature broilers with 1.5kg average life weight were used. It was found that dipping/spraying and oral treatments reduced the number of contaminating bacteria on the surface of life broilers. Oral treatment however, resulted in lower bacterial contamination after evisceration and washing compared to dipping and spraying. A combination of dipping/spraying and oral treatments were found to be the best in reducing bacterial contamination on the surface of dressed broiler carcasses. The shelf life varied between 24 and 96 hours at 4°C and 6 to 24 hours at 25° C. Surface chemical treatment resulted in the increase in shelf life with oral treatment giving the highest increase in shelf life. Broilers slaughtered at farm level had the highest bacterial contamination with shortest shelf life. It was concluded that chemical treatment of life broilers at the farm before slaughter improves both the bacterial quality and extends shelf life of broiler meat. Slaughtering broilers at farm level using unskilled labour results in heavy bacterial contamination and lowering of shelf life of broiler meat. Key Hazard Analysis and Critical Control points in processing of broilers are slaughter environment, slaughter technique, method used to control bacterial contamination on life birds, storage temperature and technical capacities of workers. Key Words: Chemical, broiler meat, microbial quality, slaughter, and shelf life. Food is processed to improve sensory characteristics, enhance nutritive contents, improve microbial quality, extend shelf live and to add convenience. But food processing may also lead to increased microbial load and make the product unfit for human consumption. Contamination of poultry meat occurs mainly during processing and particularly during bleeding, scalding, plucking, evisceration and general handling. (Frazier and Westhoff, 1988; Mulder et al., 1977). Contamination of poultry meat is still a problem even in developed countries where there is elaborate automation in poultry processing (Hickman, 1988: Horrox, 1992; Verbakel, 1988; Hickman, 1989; Martin, 1988; Kaudia, 1996). Faecal contamination which, is a major source of contaminating micro-organisms such as Enterobacteriaceae, Escherichia coli, Campylobacter, Staphylococcus and Clostridia (Nottermans et al., 1979; Kampelmacher, 1987; Mulder et al., 1977) a problem during processing of broilers (Buchli et al., 1966; Notermans et al., 1977). It eliminates the benefits of scalding at 600C. If chicken could reach the factory with fewer bacteria in the faeces and body, contamination could be minimised. Microbial contamination of meat is a world-wide problem posing great health risk to consumers. In the USA, an average of 500 people die annually due to food (meat) poisoning causes by Escherichia coli 0157: H7. This micro-organism has become the leading cause of kidney failure in American children. Countries like Japan and Hong Kong have also experienced outbreaks of meat-borne diseases. E. coli 0157: H7 epidemic in Japan in 1996 killed at least seven people and injured 8700. In December 1998, the government of Hong Kong ordered the slaughter of more than one million chickens, after a strain of influenza virus killed four people (Motavalli, 1999). The interest on microbiology of poultry meat focuses on two areas; keeping quality or shelf life and product safety. Keeping quality is primarily concerned with total numbers of bacteria present (total viable count) and the presence of organisms like pseudomonads which play key roles in product deterioration. Many methods have been used to control contamination and extend the shelf life of broiler meat at factory level. These include the use of water for washing, chemical treatment at various stages, in plant chlorinating (Cox et al., 1974), refrigeration, heat, irradiation, and use of carbon dioxide and application of chemical preservatives and management techniques such as withdrawal of feed before catching (Ayres et., al., 1950; Cox et al., 1973; Northcutt and Bullr, 1998; Ramirez, et al, 1997). These methods have only been applied post-mortem. The difficulty in controlling contamination at factory level has stimulated further research in other methods to control microbial contamination of carcasses. Such new methods include chemical dehairing of cattle and use of super-glue to seal up chickens' hindquarters. Both systems are aimed at removing sources of faecal contamination that carries micro-organisms. The use of gamma rays irradiation of meat from nuclear byproducts cobalt-60 and cesium-137 is also being studied (Motavalli, 1999). There is little information on the use of chemicals to eliminate bacteria from gastrointestinal track and body of live broilers before reaching the factory. This treatment in combination with washing of the carcass as reported by Notermans et al, (1979) may result in reduction of bacterial contamination. In this research work, chlorine and TH4 were used in an attempt to reduce microbial load coming into the processing floor with live birds. This concept of disinfecting live chicken is new and may meet some degree of resistance. It is however, an interesting research area. For example ICA laboratories in South Africa have sponsored this kind of research to test one of their new products called Virukill (Bragg, et al, 1997). Results from this research have been reported to be encouraging. Identify Hazard Analysis and Critical Control Points in broiler processing. (viii) Batch 8: Control batch of birds left on plain water for eight hours up to catching time. Feed was withdrawn eight hours before catching and collection. Water was not withdrawn until the time of catching. Feed was withdrawn for more than four hours to reduce the amount of faecal material in the gut and birds were slaughtered immediately they arrived at the processing factory. 1:200 TH4 solution was made by adding 1 litre of 10% TH4 into 200 litres of plain water. This was normal tap water from public supply line. Sixty five percent chlorine powder was used to make 5ppm chlorine solution. The strength of the chlorine solution was measured using a Lovibond Comparator. The treatment solution was made in 1000 litre tanks with taps. Ten litres was poured into a 20 litre plastic bucket. Ten litres of plain water was also poured into another 20 litre plastic bucket. The birds were carried from the shed into a designated treatment area near the exit door. Visible dirty materials on the feet were removed using a towel soaked in plain water. Each bird was then held by the feet and immersed first into plain water to improve the action of treatment solution. Subsequently, birds were immersed into the treatment solution ensuring that the entire bird was wetted. The bird was held in this solution for about 10 seconds. Immediately after this dipping operation, each bird was held under the tap and sprayed with the same solution. The feet were sprayed first. The bird was then held in an upside position and sprayed from the thighs while held by the feet. Holding the birds upside down made them spread out the wings thereby allowing easier spray of the part covered by the wings. The birds were then put in catching crates, which had been washed and disinfected using the treatment solution. The solutions were made using the same method as for in-vitro treatment. Plastic chick fount drinkers (51) were used in this experiment. Each drinker was put on top of a 9 inches building stone and filled with 4 litres of the treatment solution. Birds were made to go thirsty for one hour before the introduction of the treatment solution. An attendant walked among the birds to disturb them and make them walk to the drinking points. Birds were transported to the factory in two one-tone pick-up trucks. Fifteen birds were packed in each crate. The pick-up had four tiers and carried 500 birds. The sides and top of the pick-up were lined with nylon cloth to reduce the amount of dust getting to the birds. The birds were transported a distance of 15 kilometres on tarmac road to the processing factory. At the farm, birds were slaughtered in the open, under a tree shed as done by many small-scale farmers. A team of six local experts who are usually hired and paid by small-scale farmers killed the birds. The scalding water was heated using firewood in 100-litre half drum container. Heating birds on the head/neck using a piece of wood incapacitated them. Bleeding was effected by completely cutting off the head. The birds were then laid on the grass for about fifteen minutes to complete bleeding. The scalding water was then cooled to 65°C. Birds were scalded in lots of ten. Ten birds were dipped into the hot water and stirred using a piece of wood. The birds were held in the water for about one minute. Scalded birds were put on a wooden table and all the feathers manually plucked off. The viscera were removed through an opening cut on the abdominal cavity. This left the cloaca intact on the finished carcass. The carcasses were then washed in cold water and laid on a sack to drip. The lungs were not removed. The giblets were reintroduced into the abdominal cavity and the birds packed in high-density 10x15 plastic bags. The killing team used old feed bags as aprons. Carcasses were transported to the factory in a conventional metal meat box made of galvanised metal. At the factory, birds were immobilised by putting them in cone shaped metal containers 9 inches long, 6 inches wide at the large end and 4 inches in diameter at the conical end. The head came out through the conical end. The jugular veins were severed with a sharp knife (Halal) and the containers hanged to a rail with an attached hook. Blood oozed out of the vein into a plastic container. Bleeding was done for three minutes. All the workers wore full uniform set plus rubber hand gloves and mouthpiece to avoid contaminating products. The aim was to limit other sources of microbial contamination other than expected contamination at farm level coming with the bird. This enabled proper evaluation of each chemical treatment. Scalding was done for three minutes at 52°C in a batch scalder model KUHL with rotating platform. The 52°C was chosen to avoid rupture of the epithelial cells. Ruptured cells are entry points for micro-organisms. The scalding water was changed after each batch to avoid cross-contamination between batches. Feather plucking was done mechanically using a batch feather-picking machine with rotating fingers model SP-30-SS KUHL. The plucking machine was cleaned and disinfected after processing each batch to avoid cross contamination. Carcasses were washed during plucking. Sprinkling water to cool birds as they are plucked retards growth of bacteria, washes the carcasses during plucking and facilitates removal of plucked feathers. Washing water was previously boiled using gas stoves and left to cool overnight in 200 litre metal drums. Carcasses were individually washed under running tap water. The viscera were removed by cutting around the vent. All the internal organs were removed. Lungs were scrapped off using a lung spoon. The giblets were processed in a separate room and packed separately. Carcasses were first washed immediately after slaughter in normal portable water then in 1:200 TH4 and 5 ppm chlorine treatment solutions. Each batch was washed in a separate container to avoid cross contamination among batches. All the equipment were washed and sanitised after processing each batch. The equipment was washed first with general-purpose detergent then with chlorine based sanitiser. The equipment was then rinsed with 10-ppm chlorine solution. (iii) On 10 birds per batch immediately after evisceration and final washing. The shelf life was determined at 4°C and 25°C. 4° C and 25°C were chosen because the former is a common chilling temperature while the latter is the prevalent room temperature in the tropics. Forty eight carcasses from each batch were exposed to temperatures of 4°C and 25°C and changes in colour and smell subjectively monitored. Three carcasses from each batch were examined after every six hours. Bacterial sampling was done by swabbing technique using 0.1% peptone water at 6.8-7.0 pH and making serial dilutions. Total viable count on plate count agar (glucose tryptone yeast agar) incubated at 35°C for 2 days was used to assess the efficacy of each treatment. 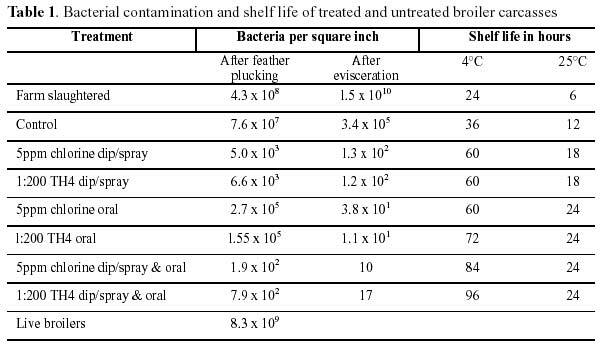 Bacterial load on live broilers was 6.3x109 per square inch (Table 1). There was a reduction to 4.3x108 in the case of farm dressed carcasses after plucking feathers. The level of bacterial contamination however, increased after evisceration and final washing to 1.5x1010. Farm dressed carcasses were more contaminated than live broilers. The increase in level of contamination can be attributed to poor slaughter techniques in which the cloaca is left intact, damage on the intestines and subsequent removal of the intestines through a slit in the abdomen. Washing the carcasses resulted in distribution of the intestinal bacteria. This is a major problem for independent and partial contract farmers who have to supply dressed carcasses slaughtered at the farm. Bacterial contamination on control samples decreased to 7.6x107 after plucking feathers and washing. There was a further decrease after evisceration and final washing to 3.4x105. This further reduction can be explained by the high standards of hygiene applied during evisceration, which minimised chances of contamination. The technique of removing the viscera and the level of training of the workers emerged as a critical control point. Dipping and spraying in either 5ppm and 1:200 TH4 solutions resulted in surface bacterial load of 5.0x103 and 6.4x103 after plucking feathers respectively compared to the control with a bacterial contamination level of 7.6x107 (Table 1). The final bacterial contamination after evisceration and washing was 1 .3 x 102 and 1 .2 x 102 for 5ppm chlorine and 1:200 TH4 solutions respectively compared to 3.4 x 105 for the control. Surface chemical treatment at farm level can therefore be effective in reducing bacterial contamination of carcasses. Oral doses of 5ppm chlorine and 1:200 TH4 solutions reduced surface bacterial contamination to 2.7x105 and 1.55x105 respectively as compared to 7.6x107 noted in control samples after feather plucking (Table 1). This is higher compared to dip/spray treatment, which resulted in bacterial contamination of 5.0x103 and 6.6x103 for 5ppm chlorine and 1:200 TH4 respectively. The final bacterial contamination after evisceration and washing was however low compared to dip/spray treated samples. 5ppm chlorine and 1:200 TH4 oral doses resulted in contamination levels of 3.8x10' and 1.1x10' respectively compared to 3.4 x 105 for the control. It is clear from these results that (i) oral treatment is more effective in controlling bacterial contamination on broiler carcasses and (ii) faecal intestinal content is a major source of carcass contamination. Combination of dip/spray and oral treatments resulted in surface bacterial load of 1.9x102 and 7.9x102 for 5ppm chlorine and 1:200 TH4 solutions respectively after feather plucking compared to 7.6x107 for control (Table 1). This was lower than contamination levels achieved with dip/spray and oral treatments as single operations. The final bacterial contamination after evisceration and washing were 10 and 17 bacterial counts per square inch for 5ppm chlorine and 1:200 TH4 solutions compared to 3.4x105 for control and 1 .5x1 010 for farm slaughtered carcasses. It was also clear from these results that contamination from intestinal bacteria start before the actual evisceration operations. A combination of dip/spray and oral chemical treatments would reduce the amount of faeces entering the slaughter facility. This would significantly reduce contamination of poultry products with harmful bacterial pathogens such as Salmonella, Campylobacter, E Coli 0157:H7 and Listeria. This process can only be successful if strict hygiene is applied at all stages of poultry production, processing and marketing. It is not a replacement of good hygiene practices. The shelf life varied between 24 hours and 96 hours at 4°C and 6 hours and 24 hours at 25°C (Table 1). Farm slaughtered chicken had the shortest shelf life of 6 hours at 25°C and 24 hours at 4°C. The control samples showed a shelf life of 36 hours at 4°C and 12 hours at 25°C. 5ppm chlorine and 1:200 TH4 dip/spray treatment resulted in an increase in shelf life to 60 hours at 4°C and 18 hours at 25°C. Oral treatment with the same chemicals gave a shelf life of 60 hours and 72 hours at 4°C for 5ppm chlorine and 1:200 TH4 solutions respectively. The shelf life at 25°C improved to 24 hours for both chemicals. A combination of surface and oral treatments of 5ppm chlorine and 1:200 TH4 solutions gave a shelf life of 84 hours and 96 hours at 4°C for 5ppm chlorine and 1:200 TH4 solutions respectively. The shelf life at 25°C was 24 hours for both. of live broilers before slaughter is a new concept in the production of pathogen free broiler meat with less health risk. Slaughtering broilers at farm level using untrained/unskilled labour results in heavy bacterial contamination and lowering of shelf life, which poses great health risks to consumers. This is one of the major factors affecting the consumption of broiler meat in Kenya since the product cannot be held for more than 18 hours at room temperatures. Broiler slaughter facilities should be located near consumer centres given that the shelf life at 25°C is not more than 18 hours. It is therefore necessary to establishment refrigeration systems in broiler slaughter units. The slaughter of broilers at farm level should be discouraged. The emergence of private small-scale broiler slaughter units under the management of meat inspectors should be encouraged. Such units should be mandated to slaughter birds on behalf of farmers at a fee. Those involved in processing broilers should be trained in hygiene, processing and handling of meat and meat products. The key Hazard Analysis and Critical Control Points on processing of broilers are slaughter environment, slaughter technique, method used to control level of bacterial contamination on live birds before and after slaughter, storage temperature and technical capabilities of the workers. Ayres, J. C., Ogilvy, W. S. and Stewart, G. F., 1950. Post mortem changes in stored meat. 1. Microorganisms associated with development of slime on eviscerated cut-up poultry. 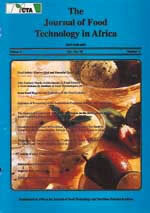 Food Technology, 40, pp.199-205. Bragg, R. R., Greyling, J. M., Beer, T. C. and Laing, M., 1997. Disinfection of poultry during production cycle: A new concept in disease prevention. Pluimvee, September, pp. 412-415. Buchli, K., Van Schothorst, M. and Kampelmacher, E. H., 1966. Untersuchungen uber die hygienische beschaffenheit von wascher resp. Luft gekulter schalachtgeflugel. Archiv Lebensmittelhygiene, 17(), pp.97-99. Cox, N. A., Mercuri, A. J., Thomson, J. E. and Gregory, Jr. D. W., 1974. Quality of broiler carcasses as affected by hot water treatment. Poultry Science, 530, pp 1566-1571. Hickman, C., 1988. Poultry production worldwide, African Farming, November/December, pp.11-13. Hickman, C., 1989. Poultry production past and present. African Farming, March, pp.25-30. Horrox, N., 1992. Americans advance on automation. International Hatchery practice, 6(7), pp.25-29. Horrox, N., 1994. The rapidly changing Far East. International Poultry Production,2(1), pp.7-11. Kampelmacher, E. H., 1987. Poultry disease and public health. British Poultry Science, 280, pp.3-18. Kaudia, T. J., 1996. Broiler Processing in Northern Ireland. Nairobi: Kenchic Ltd. fulfillment for the degree of Master of Science. Martin, D., 1988. XVIII World poultry congress. Poultry International, December. pp. 14-29. Motavalli, J, 1999. The trouble with meat. Earth Action Network, 1990-1999. Updated by webrnaster@emagazine.com http://www.emagazine.com, pp 1-9. Mulder, R. W. A. W., Dorrestein, L. W. J. and Van Der Broek, J., 1978. Cross Contamination during the scalding and plucking of broilers. British Poultry Science, 190, pp.61-70. Northcutt , J and Russel, S., 1998. Understanding chlorine. Broiler industry. September, 1998, pp.21-22. Northcutt, J. K and Buhr, R. J., 1998. Longer Feed Withdrawal Can Be Costly. Glastonbury, Connecticut. Arbor Acres Farms Inc. Service Bulletin. No2 January 1998. Notermans, R., Terbijhe, J. and Van Schothorst, M., 1979. Removing faecal contamination of broilers by spray cleaning during evisceration. British Poultry Science, 210,pp. 115-121. Notermans, S., Van Levsden, F. M. and Van Schothorst, M., 1977. Suitability of different bacterial groups for determining faecal contamination during post scalding stages in the processing of broiler chickens. Journal Of Applied Bacteriology, 430, pp.383-389. Pope, C., 1996. Salmonellosis in poultry and people. World Poultry-Misset. May 1996, pp.13-14. Sanders, D. H. and Blackshear, C. D., 1970. Effect of chlorination in the final washer on bacterial counts of broiler carcass. Poultry Science, 500, pp.215-219. Sarakbi, T., 1998. A new method of treating recurrent salmonellosis. Poultry International, 37(3), pp.42-43.